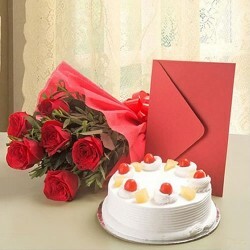 A special gift for your dear one’s birthday. In today's fast forward life, we are so busy with our work schedule that we hardly get time to spend with Our friends rather we can say, we hardly get time to express feelings our loved ones. So, if you are thinking of expressing your love to your friends then place your order today and surprise them on their Birthday. Surprise your better half on her birthday. You can surprise your friends by gifting them this hamper on your farewell or fresher. Keep the stem of flowers in water to give long life to your wonderful bouquet.